“In the future, space on the street means status,” says RJ Cobalt. “And materials change shape and colour with complete flexibility.” RJ works with her company on emotional artificial intelligence. Today, however, the young woman with the blue hair and the Atari T-shirt is at Europe's biggest tech and start-up conference, Slush in Helsinki. She is part of a workshop; Porsche and the tech magazine Wired are the hosts. The topic: sports cars in 2050. Science fiction or the reality of the future? 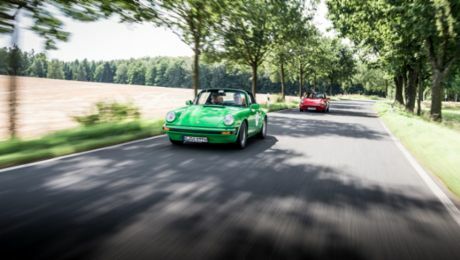 Porsche has been shaping the future of the sports car for 70 years. In 2019, the Taycan, the first all-electric Porsche, will hit the market – a step into a new automotive age. What might happen in the next 70 years could hardly be more critical. In Finland, Wired and Porsche have invited pioneers from tech companies and start-ups to develop visions for the future. The workshop brings together a mixed group of deep-tech founders, designers and strategic innovators. The result: two future scenarios. Susan opens her eyes, looking down at the Golden Gate Bridge. She feels refreshed after 15 minutes of meditation up in the clouds, having been fired up there by her transparent flying ball. Up high above the land below, she finds herself in a flying sports car. Susan's father was still on the road 20 years ago, back in 2030 – a time when flying balls were not yet suitable for the masses. Today they are an indispensable part of San Francisco life. The city has changed a lot in two decades. The manufacturing industry has long since moved underground, and goods are sent through tunnels into the city and even those who commute from elsewhere arrive underground. On the surface there is space for leisure activities such as parks, but also for sports races - on the road or in the air. If you can afford a flying ball, you get a device that fits snugly to your body. In sports mode, the large transparent marble is controlled by leaning forward to accelerate, or backwards to brake. The inventors copied this from the electric scooters that emerged in the noughties. Today, flying balls are what used to be called sports cars in the past. They are powerful acceleration machines. They let people travel - high in the sky, deep in the sea, across the country or through street canyons in San Francisco. Adrenaline rushes through Zheng Ma's body. He has just taken control of his flying hypercar. The assistance systems switch off. The power of the six hybrid engines vibrates through his fingers. Beijing in 2050 is an ultra-megacity with a centre that grows vertically in height. It is the continent's central growth engine, where a central artificial intelligence (AI) controls administration and traffic. The aim is to present Beijing to the world as a model city and lighthouse for China. True luxury, here, is having space and time. Even among the upper classes, only a few have their own hypercar. But flying yourself – without the autonomous pilot or augmented assistance systems, but with the very real danger of an accident – requires a permit from the highest level. Zheng Ma observes the raindrops on the windscreen. He points the machine steeply at the sky and heads for the cloud cover. The G-forces pull at his body but he knows how to fly. His vehicle taught him or, rather, the AI at the core of the vehicle did. Zheng Ma has had this core since birth. It has grown with him, from vehicle to vehicle. When Zheng Ma shoots through the cloud cover, the assistance systems switch on again. He has crossed an invisible border and reached an area where several major logistics routes intersect. His vehicle has right of way everywhere – that is the luxury that comes with such a hypercar. Zheng Ma’s pulse appears on the display alongside a whole range of other bodily diagnostics. Sophisticated sensors act like perfect doctors, monitoring every one of his functions. His pulse returns to normal, but the experience – the exhilaration – stays with him for several days. Zheng Ma is lucky: only a select few can afford to leave the surface of the city and feel the incomparable buzz of ‘real’ life. The possible future sounds fantastic, but it also raises many questions: in addition to technological and economic implications, political and social issues must be considered. "Technological developments will have a strong social impact. In London, for example, we already see a strong distribution of social classes. One scenario could be that this happens even within a block of flats," says Bryn Balcombe. He is Chief Strategy Officer of Roborace, the world's first electric and autonomous racing series. He is also a member of the Global Future Council on Computing of the World Economic Forum. In addition to all the future scenarios, one thing above all is clear, says Christian Knörle from Porsche: "Creating innovation for the future needs different perspectives. That's why Porsche will continue its dialogue with experts from various technology fields and industries in order to generate new ideas for today's world and successfully shape the next 70 years". Because even if we want everything to stay the way it is, everything must change. Slush, Europe's largest tech and start-up conference, took place in Helsinki from 4-5 December. Its main aim was to provide entrepreneurs with a platform from which ideas for the future could be discussed openly with the team from Porsche. As inspiration, the sports car manufacturer and its partners from the start-up scene organised talks and workshops where personal success stories were presented and insights and experiences were shared. At the Slush conference in Helsinki, Porsche announced the “Porsche NEXT OI Competition”. The world premiere of the new Porsche 911 heralds three digital developments. Time for a quick stop at Porsche Digital. Porsche has increased its investment in venture capital activities by EUR 150 million for the next five years.